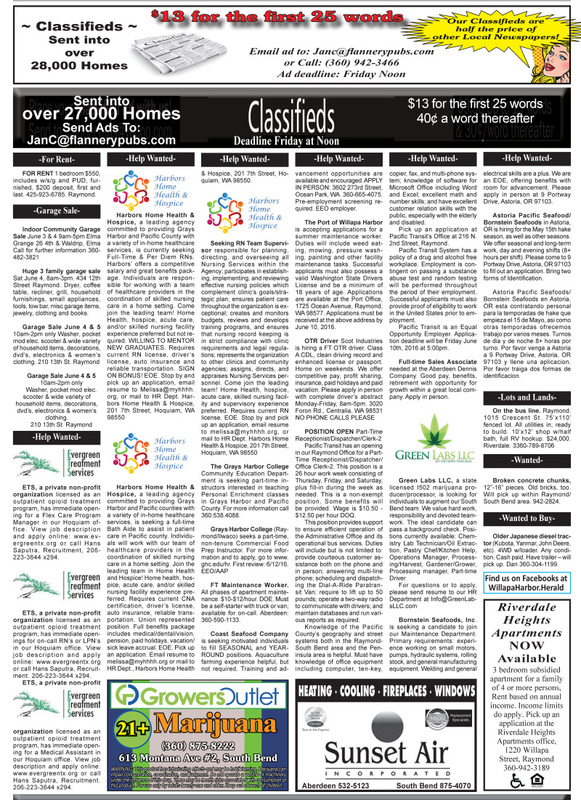 Showing 31 articles from May 31, 2016. Aberdeen Police are investigating after someone tried to pry open the back entrance of the Tobacco Depot overnight. The department was contacted early in the morning by the owners of the Tobacco Depot, in the 1300 block of Sumner Avenue after they discovered the damage. Beginning June 10, 2016, the Cosmopolis School District will be providing free meals to children during the summer as part of the USDA Summer Food Service Program. 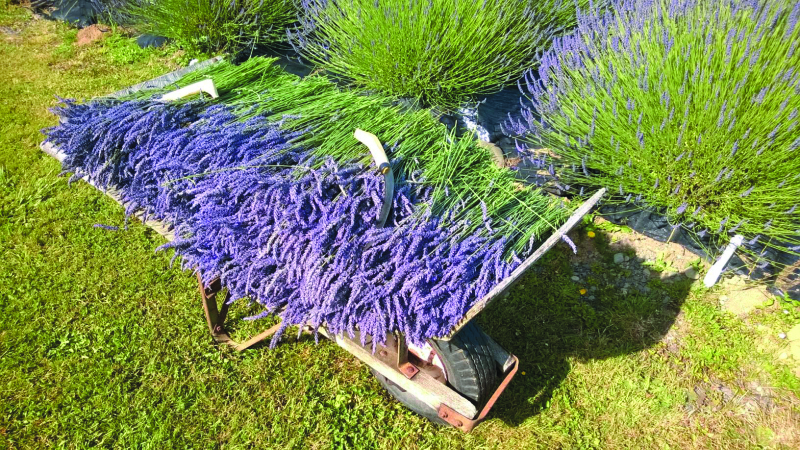 Dale's Lavender Valley Farm at 48 Robertson School Rd., Hoquiam will be holding its first Lavender Festival Saturday and Sunday, July 2-3 from 9am-5pm. Proprietor and Master Gardner Dale Dineen has been growing lavender on her farm for the last seven years. It began as a labor of love and healing after losing her son. Mrs. Dineen always had a love for lavender and planted 1000 lavender plants on her farm. Along with selling bundles of lavender she makes soaps, sprays and sachets. There will be arts and craft vendors and demonstrations. Admission and parking are free. 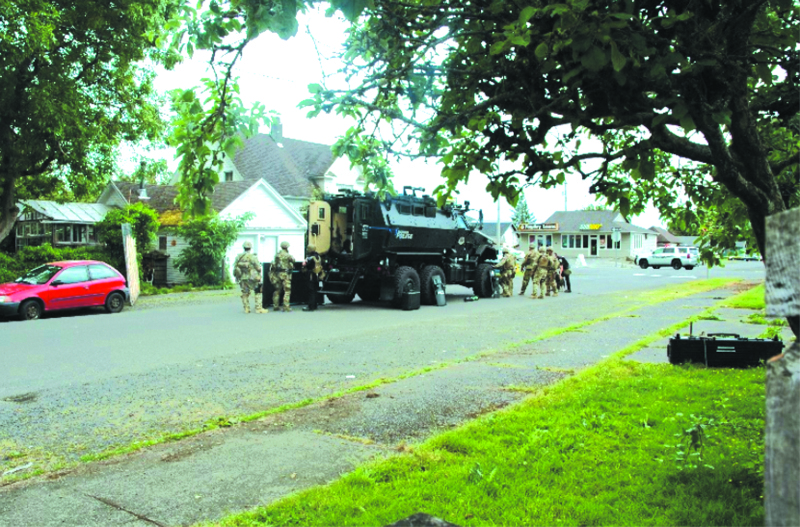 Photo by the Hoquiam Police Department - The Aberdeen Regional Crisis Response Unit provided specialized equipment and trained members from the Aberdeen, Hoquiam, Montesano and Cosmopolis Police Departments during the standoff. On Tuesday, May 24 at approximately 6:21 am, Hoquiam Police were advised of a male firing a weapon in the 2700 block of Simpson Avenue. Upon arrival they observed a blue 1980 Volvo with virtually every window shot out. The investigation revealed a 41-year old Hoquiam male had been living in a makeshift apartment behind 2701 Simpson Avenue, and for unknown reasons went outside and shot the windows out of the Volvo before returning to his apartment. An Ocean Shores Police Officer was assaulted while investigating a traffic collision just outside of the city on Wednesday, May 11. At 6:19 pm on Monday May 16 the Washington State Patrol responded to an accident on the beach in front of the Ocean Crest Resort located 1 mile south of Moclips. A teen from Aberdeen has been returned home after being reported as a runaway on Monday. The teen's parents dropped her off at Miller Junior High Monday, and she was not there by the end of the day. "Secret Garden" by David Rodriguez on display from Alder Grove Gallery. The Aberdeen Art Center, located at 200 W. Market St. in Aberdeen, is proud to announce the opening of its first tenant Alder Grove Gallery. Gallery hours will be Friday, Saturday and Sunday, 4 pm to 8 pm beginning with the June 3 Aberdeen Art Walk. The center is in the process of building a list of local artists it can feature and help promote. Photo courtesy of Dave Vorse - The new Castle Rock visitor center set to open next month. 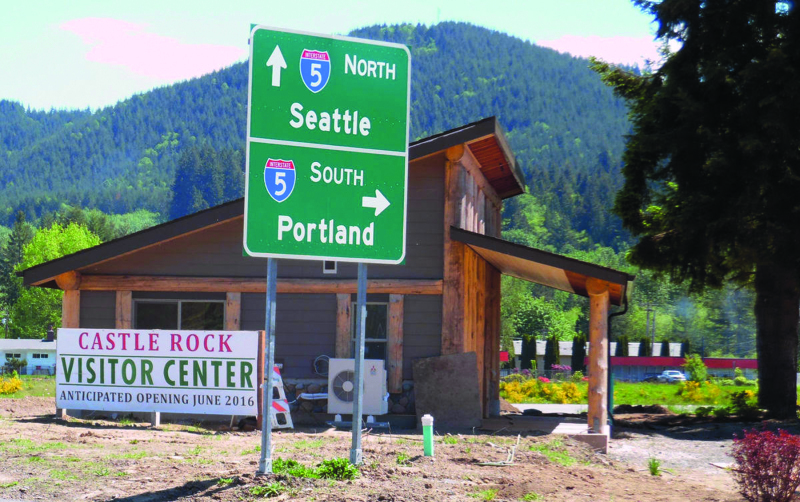 Scheduled and ready to open next month, Castle Rock's new visitor center is located beside the on-ramp off exit 49 on I-5. Photo by Derrick Paul - Firemen try to extinguish the fire caused by vandalism at Jake's Fireworks. 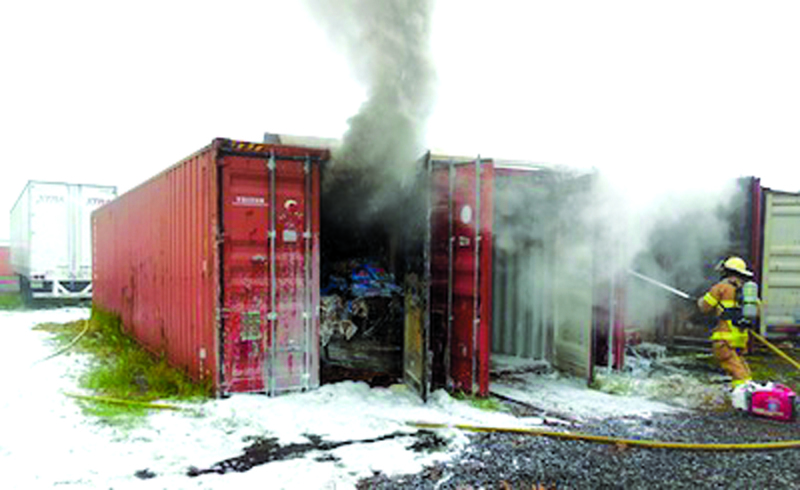 Fire at Jake's Fireworks is deemed "Suspicious"
Fire investigators are looking into the fire at Jake's Fireworks as an act of vandalism after the Winlock business suffered an estimated loss of $100,000 worth of fireworks. Napavine's Grace Hamre came into Cheney knowing her potential to shine and bring home a few state championships, but four is quite the haul. Hamre won the 100 (12.78), 200 (26.09), 400 (58.65), and also was a part of the winning 4 x 200 M relay team (1:46.33). The other members of the relay team were Mollie Olson, Xylee Pope, and Alex Pope. Napavine girls placed third overall in points. 5k or 10k scrambled Egg Family Friendly Fun Run for Winlock Egg Days is scheduled for June 18. Each person that pre-registers will receive a tee-shirt. The first 100 participants to cross the finish line will also receive a medal. 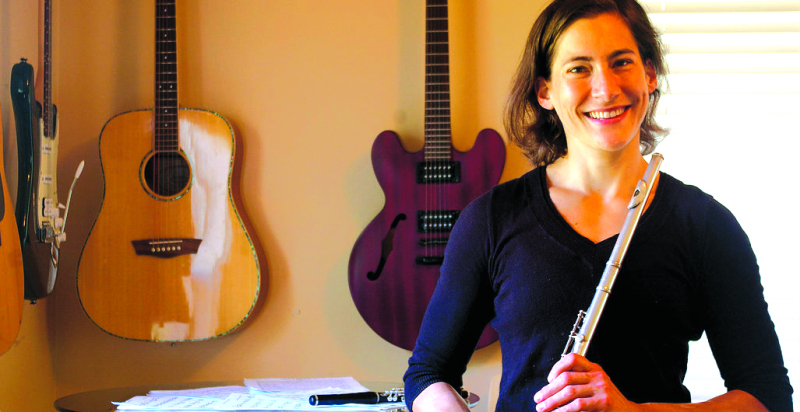 CENTRALIA - The Pacific Northwest Chamber Orchestra will conclude their 13th season with the annual "Soaring Soloists" concert at 7:30PM on Monday, June 2 at Centralia College's Corbet Theatre. The Central 2B league always represents in the 2B state tournaments, and it is no different in the baseball postseason. Three of the four teams come from this league (Toledo, Pe Ell-Willapa Valley, Toutle Lake) and the lone team from outside the Central 2B league is Asotin, Toledo's next opponent. The long road ahead came to a grand conclusion. The Indians, who had a rough district tournament and wound up with a 4th seed into state, fought through the Eastern bracket and wound up in the Final Four again. The Central 2B league represented as usual, with three of the final four teams being from the Central 2B league. Toledo defeated Asotin handedly to set up a rematch with Pe Ell-Willapa Valley, who defeated Toledo in the last series of the regular season to take the league title. Winlock High School hosted the 2016 Southwest Washington Massed Band festival on May 10th with 13 'B' schools participating. Total, there were about 290 high school band members packed in the high school from 9:00 AM until the concert which began at 7:00 PM. 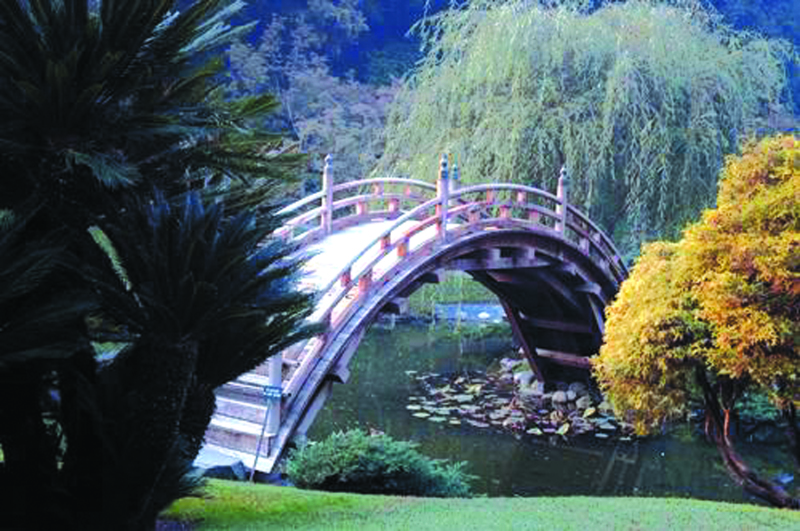 The Winlock City Council began its normal city council meetings with a public hearing regarding a Community Development Block Grant (CDBG) to replace 113 galvanized steel lines within the public right-of-way. The proposed project improves existing infrastructure, water quality, and lessens financial impact to low and moderate income residents. It will also reduce water loss and reduce increasing maintenance due to leaks. The project will mainly focus on the First Street lines. Please welcome Dr. Katie Baker and her health practice, Stone Turtle Health to the area. She has signed a lease with Mudtown Fitness to open up a permanent clinic space in Raymond. 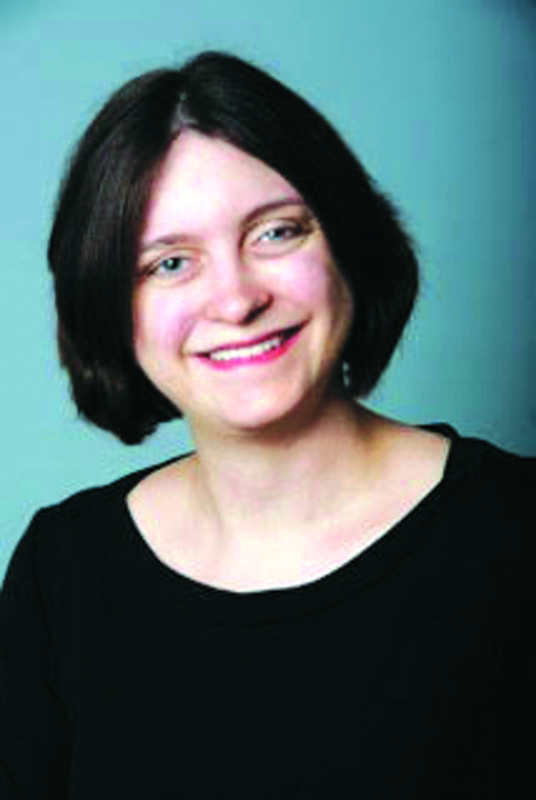 Dr. Baker is a naturopathic doctor who focuses on family medicine. Dr. Baker is a graduate of Bastyr University and has gotten her education around the world. She studied herbal medicine in Tuscany, pediatrics in Bolivia, and hydrotherapy and physical medicine in Russia. While on her travels, turtles and turtle images kept appearing, hence the name Stone Turtle. 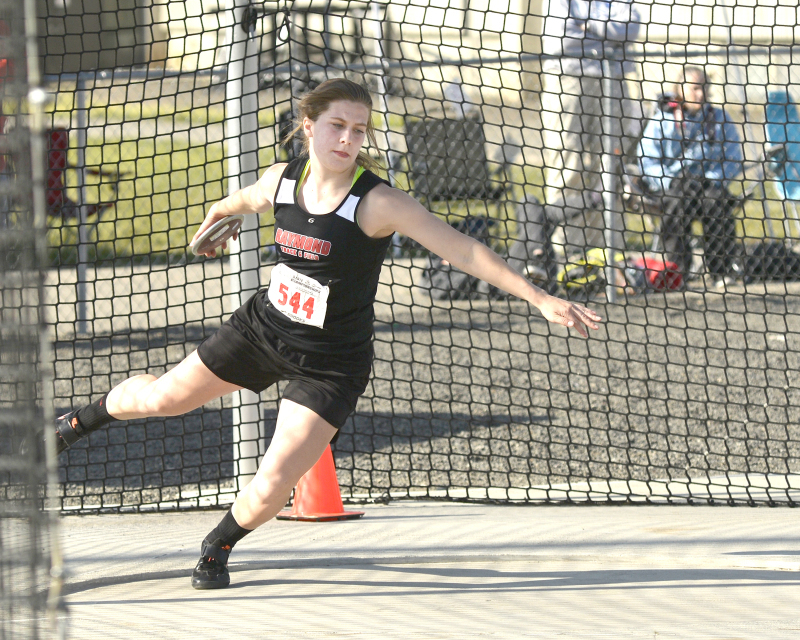 Raymond sophomore Karlee Freeman set a State record in the discus at the 2B State Championships Meet on the campus of Eastern Washington University in Cheney last Thursday through Saturday. The Raymond boys captured its fourth straight trophy at State in dramatic style. Photo by Patrick L Myers - The American Legion fired off several rounds after the service was performed, in commemoration of those being remembered on Memorial Day. Photo by Michael S. Hagar - Miss Washington 2015 awaits a response from local students at Raymond Jr./Sr. High School. On Wednesday May 18th, the current titleholder of Miss Washington 2015 spoke to students at local schools as part of her media tour across the state. After waking up early to complete the hour and a half drive to town, Elisabeth Gabrielle Jackson, 24, gave a presentation to students at both Raymond Jr./Sr. High and South Bend Middle School regarding the targeted advertisement of youth by corporations and marketing professionals. The South Bend City Council met on Monday, May 23 for the bi-monthly city council meeting. Mayor Julie Struck started the meeting with the pledge of allegiance per usual, and approved the minutes from the previous meeting's agenda as well as the agenda for the current meeting. Official Pacific Co Delegation - Day 1 of WA State Republican Party Convention in Pasco. Left to right- Keith Adams, Aaragon Markwell, Nansen Malin, Glenn Thomas, Antony Barran, Cora Barran, Mary Reed and Bill Reed. Not pictured - Alternates Jack Smith, Edie Faylor, Art Wuerth, Patty Hardin, Michele Reed. Working long into the night on May 25 following a two-day trial a Pacific County Jury returned guilty verdicts against 27 year-old Lendin Saiti for unlawful possession of heroin, theft of a motor vehicle, unlawful possession of a firearm in the first degree, and use of paraphernalia. The jury found Saiti not guilty of theft of the firearm. Photo by Pat Myers - Adrian Medina, winner of Thriftway's recent shopping spree drawing, runs through the store nabbing and grabbing as he goes. Medina, huffing and puffing as his loot was tallied ended the 3 minute spree with a total of $115.84. Pacific County Sheriff Scott Johnson graciously accepted to do a lengthy interview with the Willapa Harbor Herald. Johnson, who graduated from South Bend High School in 1980, is a graduate of the Washington State Sheriff's School in 2010, a graduate of the National Sheriff's Institute, in Aurora, Colo., a graduate of the Rural Executive Management Institute, in Denver, Colo., a graduate of the University of Arkansas Mid + Executive Police Management in Little Rock Arkansas, a graduate of the Washington State Patrol Trooper Basic, Shelton, Wash., 1982, and the Washington Criminal Justice Training Commission Reserve Academy of 1982. LONG BEACH - A 12-year-old girl, Daniela Garcia, drowned Sunday night near Klipsan Beach. "These just make me sick. It's like they never end," said Pacific County Sheriff Scott Johnson. "This drowning is a terrible tragedy and our thoughts and prayers are with that little girl's family."